How Much Trick-Or-Treating Would It Take to Power Your Halloween Decorations? We’ve tried to calculate how much sweat and human effort it would take to charge a smartphone, brew a pot of coffee and even power a refrigerator. But this whole … READ MORE How Much Trick-Or-Treating Would It Take to Power Your Halloween Decorations? 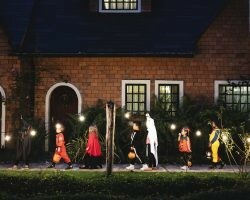 The post How Much Trick-Or-Treating Would It Take to Power Your Halloween Decorations? appeared first on Direct Energy.